Gstaad is a popular Swiss ski resort, its vast with several villages and seven different skiing areas. In the quaint village of Saanenmöser, you have access to the most ski slopes, and you can walk to the lifts from the Gstaad Golfhotel Les Hauts & Spa. The 4-star Golfhotel is a grand chalet building above the village of Saanenmöser, a lovely ski lodge for families and skiers, owned by a delightful Swiss family that know how to cater to skiers and kids of all ages. 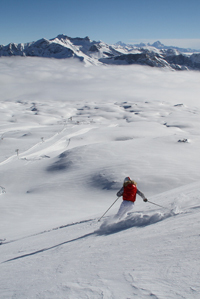 To ski Gstaad’s ski regions of Hornberg and Saanersloch, it’s a seven-minute walk from Golfhotel through the village to the Saanersloch Gondola base, which whisks you up to the Hornberg, Horneggli and Saanersloch skiing area and 75 miles of prepared pistes. The entire ski region of Gstaad which you can drive to or reach by train from here, includes 53 lifts and 220 kilometers of prepared slopes. After skiing Gstaad’s Hornberg and Sannersloch gorgeous groomed ski slopes or venturing just off the trail into acres of powder skiing at Hornberg, you will be glad to return to the Golfhotel, to one of 55 guest rooms after your short walk up the hill. A Ski Room with boot dryers is located by the parking garage entry. The Golfhotel Les Hauts lobby leads to several inviting lounges and dining venues, Belle Époque for formal dinners, Möserstube which overlooks Heidi’s garden, the rustic Swiss restaurant Bärengraben – the beautifully cozy bear den for fondue, the fireside bar and a Snowbar umbrella bar at the base of the Saanersloch. The Golfhotel fireside bar and Cigar Bar are perfect for après ski or an after dinner aperitif. For kids, Golfhotlel Les Hauts offers an indoor pool in the Spa, kids menus, and even a delightful kids playroom with a secret entrance suited only for small people. Saannenmoser at Gstaad is a better value, quieter and less high end shopping than Gstaad village 15 minutes to the west, and here you are able to walk to the ski lifts of Snow Paradise 2000 – Gstaad’s family friendly ski terrain where ski school and children’s programs are based. Our Golfhotel room was beautifully decorated – deer skin rug, leather headboard, lots of wood and stone create a casual but classic alpine balance. The balcony provided delightful views of the snow loaded chalet roofs in the village and the spectacular mountains beyond. Large private bath, flat screen TV, free WIFI, and a mini bar made for additional amenities. 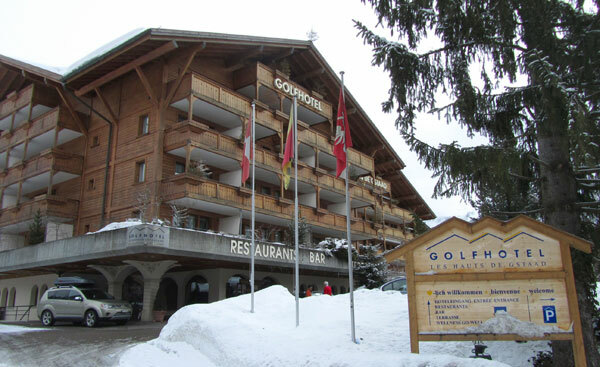 The Golfhotel harkens back to early Swiss ski days, but all the rooms have been modernized. The Wellness Spa downstairs offers steam and sauna rooms, an indoor pool where kids are welcome, fitness facilities, steam showers and an adult relaxation room. After skiing all day at Gstaad’s ski slopes, I didn’t need a relaxation couch. Other recommended lodging properties in the Gstaad ski region include the 5 star Grand Hotel Park in the charming village of Gstaad, and the on mountain Hamilton Lodge – a unique setting up on the slopes of Rinderberg reached only by gondola, truly ski in ski out. Gstaad Stats: 9,843′ summit, 6,398′ vertical, 53 lifts, over 136 miles including 103 prepared ski trails plus off-piste and high elevation glacier skiing.